As usual I have a million projects going on and have a bunch of recipes from the last few weeks that I’ve been meaning to post, each of which I’m super excited to share with you, but since it’s a rainy, gloomy day on my end (as it was when I came up with this recipe) this soup recipe seems fitting. Now as you can imagine, soup is rarely on our menu during these summer months when it feels like it’s nine million degrees outside, but as I previously stated, every now and again we’ll get a dreary day that warrants a soup fix. I’m sure I’m not alone in saying I love Panera’s broccoli cheese soup, but being that I really have no business eating anything in its full-fat form until I reach my goal weight, I’ve been forced to explore healthier soup options and this inspired me to come up with a “skinny” version of broccoli cheese soup (and I already had the ingredients on hand). 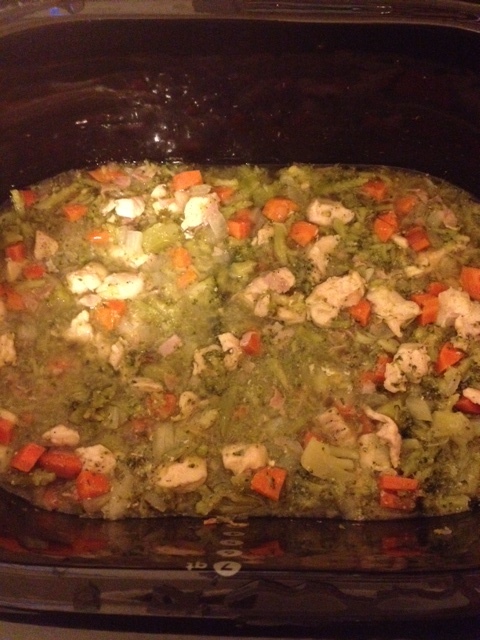 So upon hunkering down for fake hurricane Arthur, lol, I prepped this recipe and threw it in the crockpot, I decided to add chicken in order to satisfy my hubby’s need for a “meal” (we often disagree on whether or not pasta or soup without meat constitute a meal, I say yes, he says no way, lol) and because I had two chicken breasts left over from the yummy crockpot chicken fajitas I had made a few nights prior. 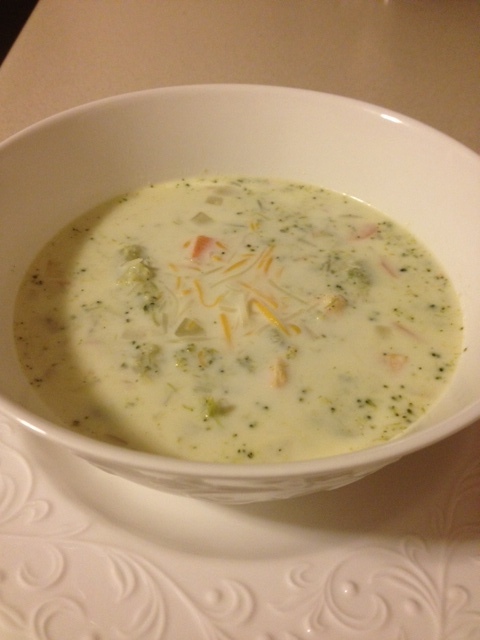 This soup was super easy and was a huge hit! The chicken makes it hearty so you’re less likely to miss the heavy cream and extra cheese. 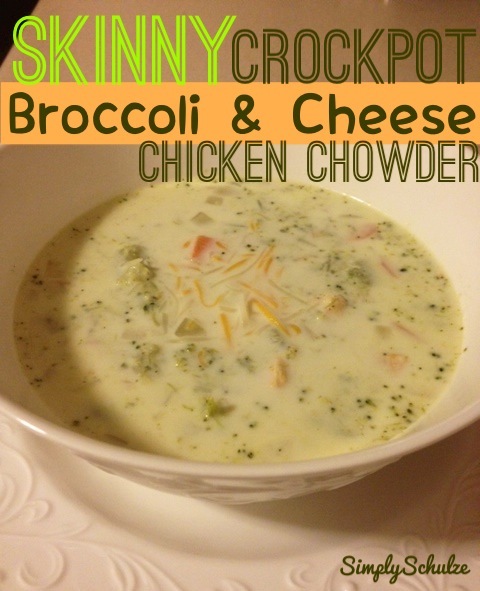 Speaking of heavy, I actually now find myself to prefer the “skinny” version of many recipes, because while comfort food is delicious I tend to feel like a sluggish blob after finishing a meal, where as after enjoying the skinnier version I find myself feeling satisfied but less blob-like 🙂 If you’re a broccoli cheese soup fan try this one out and let me know what you think, it’s super easy (thank you, crockpot!) to throw together andeasy on the wallet as well! In your face, Panera (just kidding, I love you lol)! 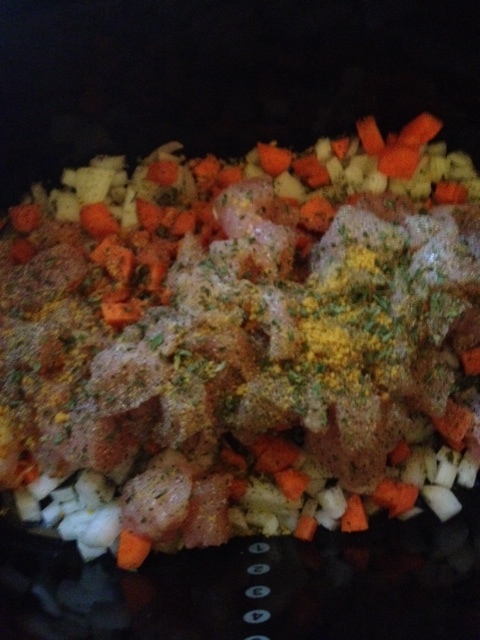 Step 1: Add cubed chicken, diced carrots, diced onions, bullion, black pepper, garlic powder and thyme to the crockpot (if using fresh broccoli add at this point as well), and set to high for 4 hours, adding frozen broccoli when there is about 1 hour remaining.